Recently I was a guest at a great party for L'Oreal Paris at the Four Seasons Hotel. I met up with my great, great friends, make up artist Mai Quynh, and beauty writer/owner of The Beauty Closet, Shannon Levy. The champagne and Elnett flowed at the fancy celebration. Afterward, we made our way down to the restaurant to continue the party. 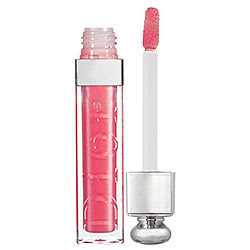 When my lips were feeling dry, I reached in my purse and grabbed my Dior Lip Polish. I had no idea what a stir I would cause at our table. Everyone wanted to know what I was using and were all captivated by the formula, and innovative rotating applicator! Fast forward to Thursday... I met up with Shannon at the Laurel Tavern so she could do a Q&A with me for BE magazine. When I walked in to the low-lit bar, I couldn't help but notice she looked radiant. I was so distracted when she was talking to me, I finally asked "what lip gloss are you wearing?"... "The Dior gloss you showed me at the Four Seasons!" she gushed. She went on to say how much she loves loves LOVES it (and let me tell you, this girl KNOWS her beauty products!). 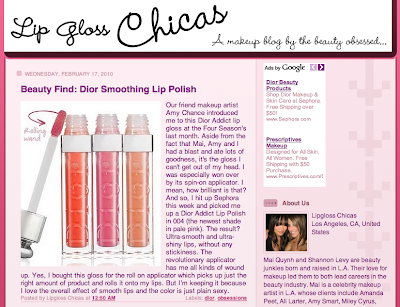 Come to find out, she had even blogged about it on the beauty blog she shares with Mai, Lip Gloss Chicas. So adorbs! I love turning my friends on to great products! 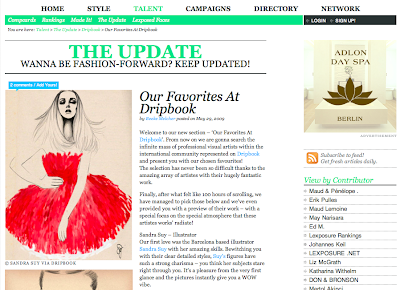 Check out some cool images from a shoot I did for Women's Wear Daily, styled by Leila Baboi. 2010 is definitely shaping up to be an amazing year! Thank you to everyone who has emailed me recently. If I haven't gotten back to you yet, I will soon! Also, due to all the spam comments on my blog, I am having to add word verification. I've tried to avoid that because they are so annoying, but unfortunately I don't have time to moderate comments myself. :( I hope you will continue to comment even though it takes an extra step! UPDATE: I tried deleting the spam comments from other posts and accidentally deleted some actual reader comments. Sorry about that! I'm late to this, but thank you lexposure.net! Check out my new Pac Sun ads in Seventeen, Nylon, and Teen Vogue! I've also done a nice update to www.amychance.com, so check it out!